Who doesn’t like a blonde every once in a while? Blondes from Belgium, even better. Without further ado, let me introduce a blonde from across the Atlantic. 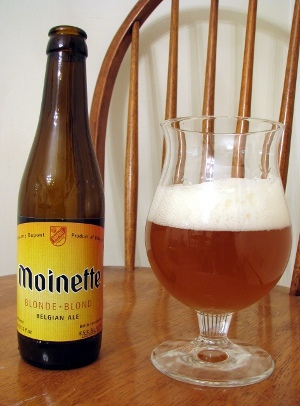 Hailing from Belgium, brewed by Brasserie Dupont, we have Moinette Blonde. A beer in the style of a Belgian Strong Ale and strong it is with an ABV of 8.5%. Breaking out the tulip glass and pouring ever so gently, this Belgium had quite a nice fluffy white head. It had a cloudy orange honey appearance. Off to the nightly dipping of the nose into the glass revealed a spicy, banana, yeasty, & slightly hoppy aroma with some alcohol. Upon taking a generous sip, I was hit by those spicy banana flavors first with some yeast and then a hoppy bitter finish with the alcohol presence making itself known. It had a medium body to the mouthfeel with lots of carbonation. Not too shabby…although I much prefer Duvel over this. Fast forward a few hours, now back at home. I was glad I put a bottle of Duvel in the fridge as I would use that as beer #5. 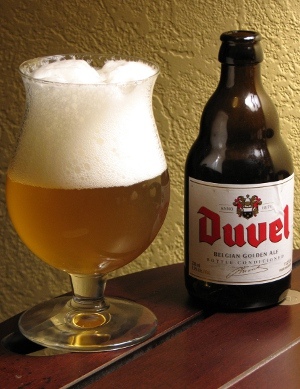 Duvel is a Belgian Strong Pale Ale or Golden Ale with an ABV of 8.5%. This is one of the best beers I have ever had, absolutely wonderful! This is one beer any beer lover should try at least once.